All e-books are available at Amazon.com and at Smashwords.com. Amazon's got you covered for your Kindle--or you can download a free Kindle for PC app for your computer--and I use Smashwords to distribute to other outlets, which include Apple e-readers, Sony, Kobo, and just about any other way you can read an e-book, including Barnes & Noble for the Scoop Jackson books. 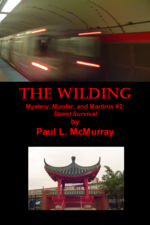 The "Mystery, Murder, & Martinis" series can be purchased directly from Barnes & Noble. Amazon, Smashwords, and B&N all offer free chapters. So check them out according to your tastes and I hope you find something you like. EVIL CAMP (Scary: Middle-Grade to Y/A). See the Scoop Jackson page for info. 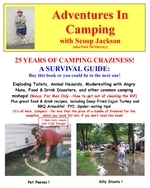 Adventures In Camping with Scoop Jackson (Humor, IMHO). 25 years of camping mishaps! See the Scoop Jackson page for more info.